While it was an early morning Thursday, we made it to the airport and onto our flight with no problems. I’ll write at a later date about the experience on United’s new business class as I know it isn’t the most pressing news to cover. 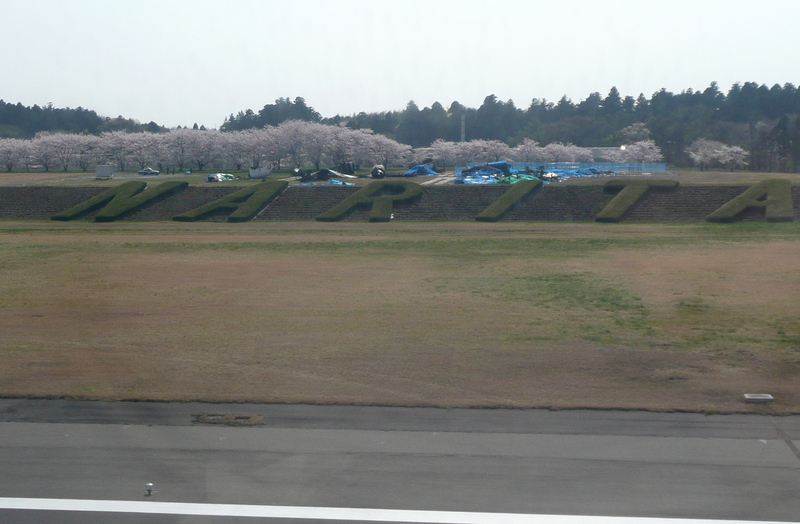 It was still sakura (cherry blossom) season when we touched down at Narita airport north of Tokyo. A row of trees lined the runway, their light pink blossoms at their peak. We passed through immigration and customs with no problem, located the post office where I picked up our rental mobile phone, then we headed to the train station. Ninety minutes later we were walking to our hotel, the Ueno First City Hotel, located in the Ueno district near Tokyo University. The Ueno First City Hotel wasn’t our first choice. Several of the recommended ryokan (traditional Japanese inns) were full. But this is actually a nice hotel. We have a Japanese style room that is tiny but comfortable. The staff is friendly and helpful and we’re less than a ten-minute walk to three different rail stations. We met Taro for dinner, a friend who used to be the Assistant Director of the SF Int’l Asian American Film Festival. 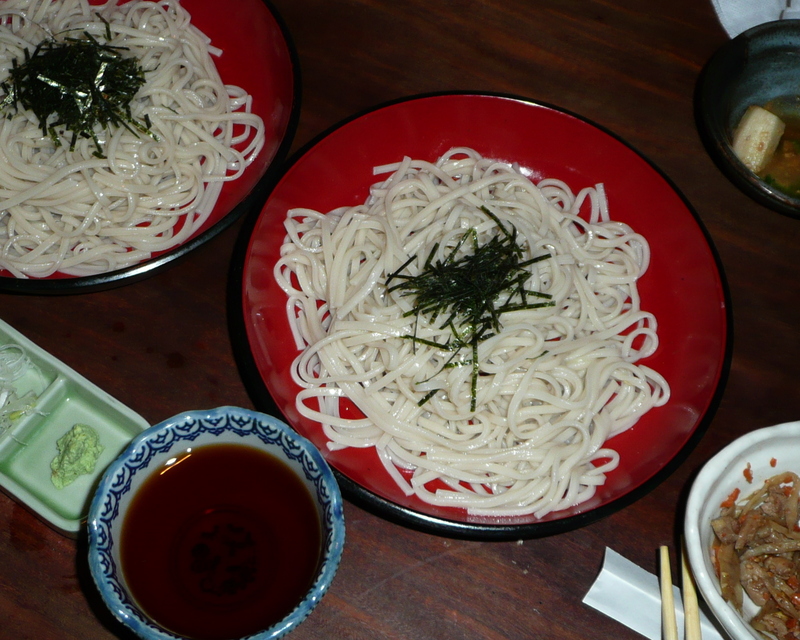 Taro took us to an izakaya in the neighborhood that specializes in lotus root dishes. 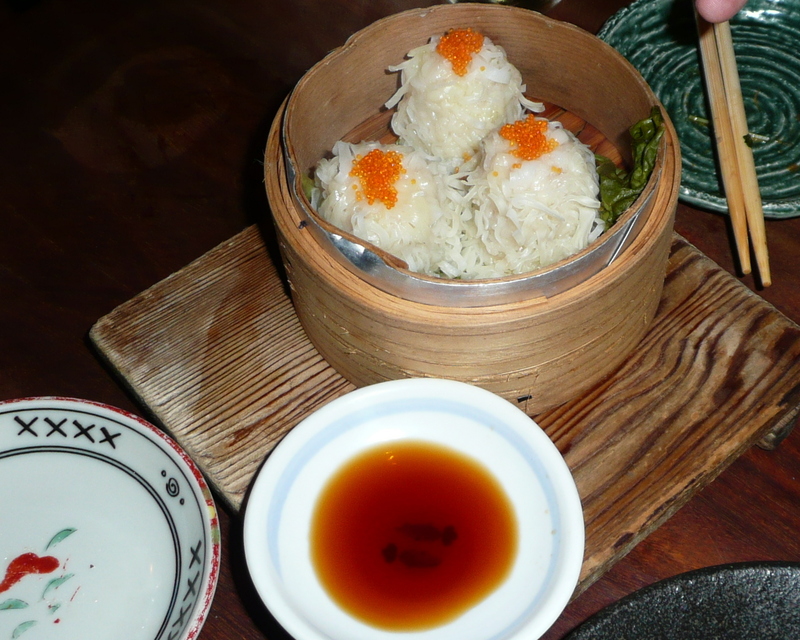 Izakaya – literally, “drinking houses” – are pubs that serve small plates of food. Kind of like tapas bars, you order a few small plates at a time to accompany your drinking, until you are full. We had some excellent food and, really, the food is just about the most important thing to experience in a culture. 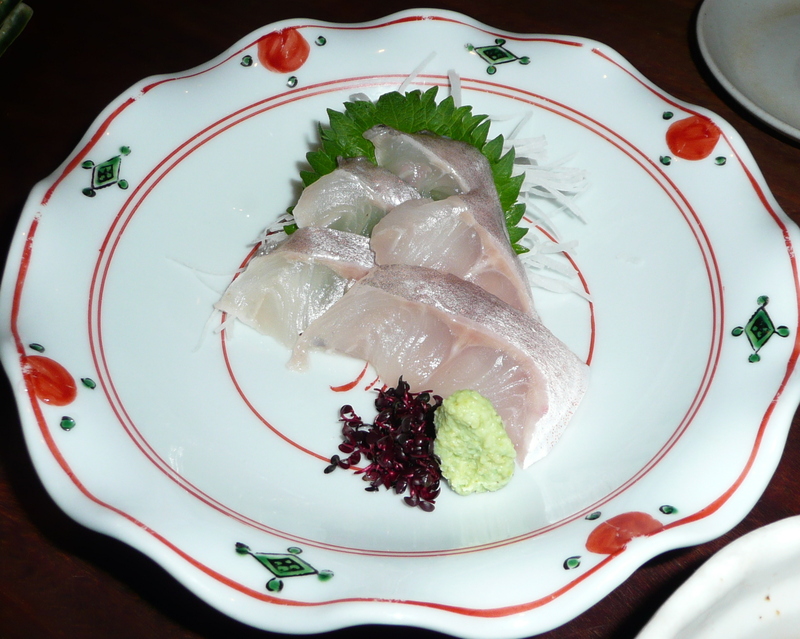 Hokke – a type of sashimi from a fish from the northern island of Hokkaido. 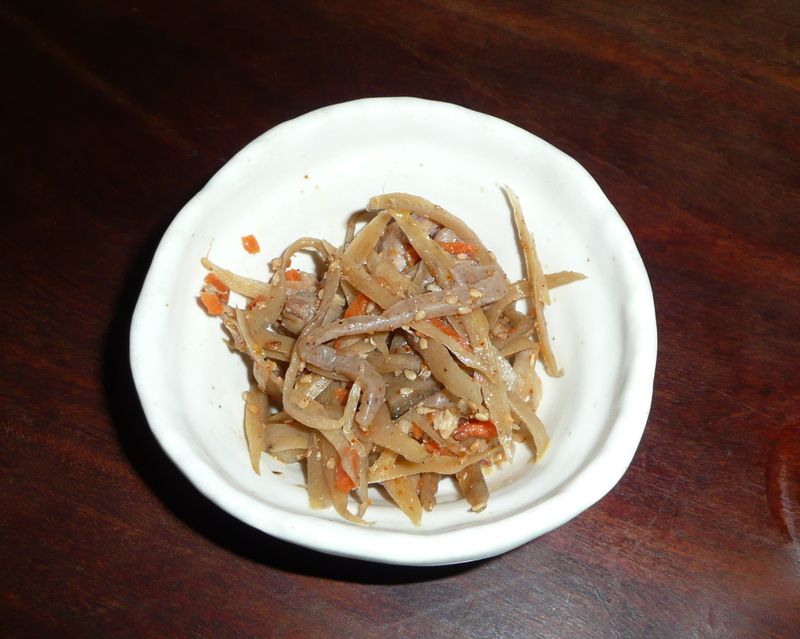 Fried lotus root with grated fish meat. 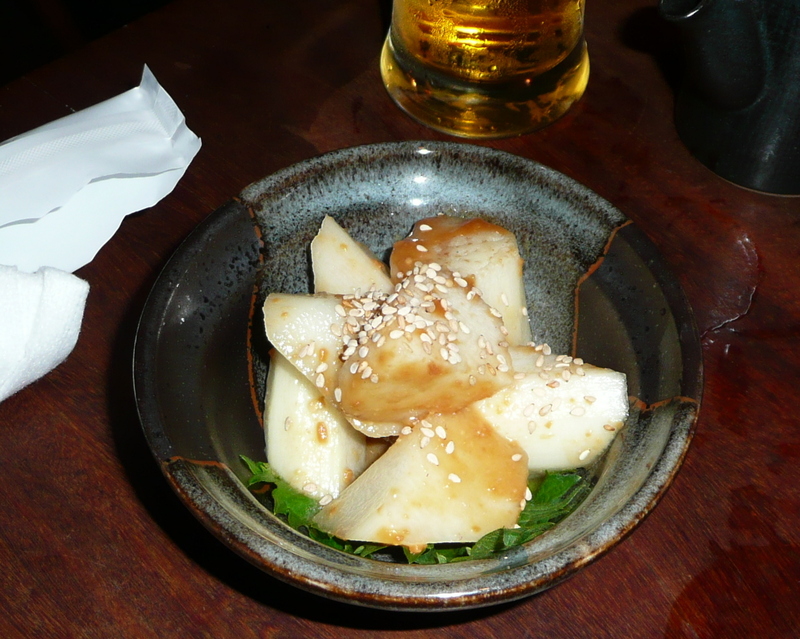 Yamo-udo, a mountain vegetable that is known in English as jicama. 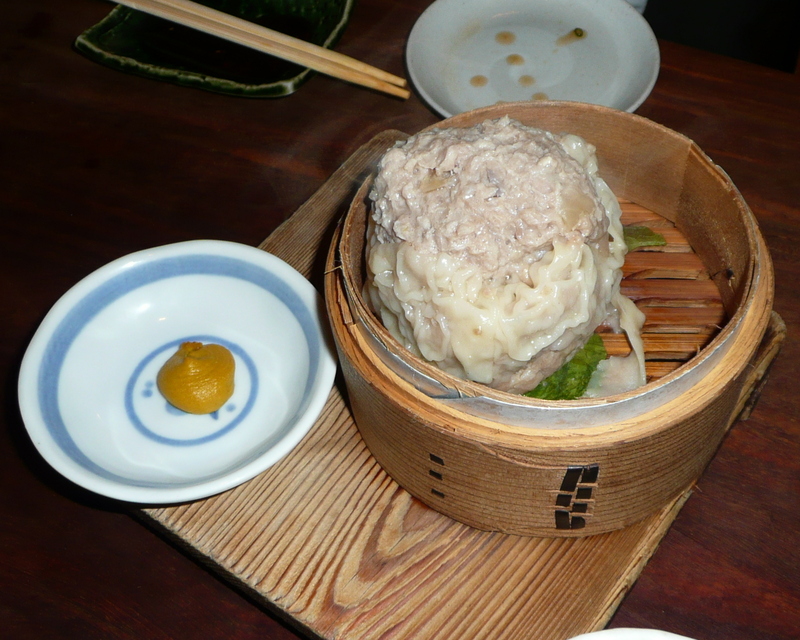 A super-sized shui mai, a minced pork meat dumpling that is borrowed from Chinese dim sum. 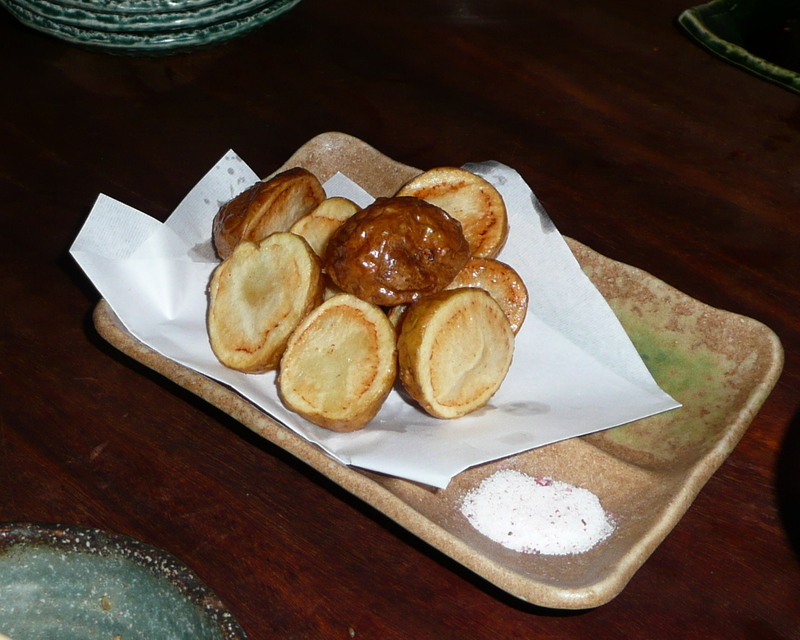 New potatoes fried and served with chili salt. 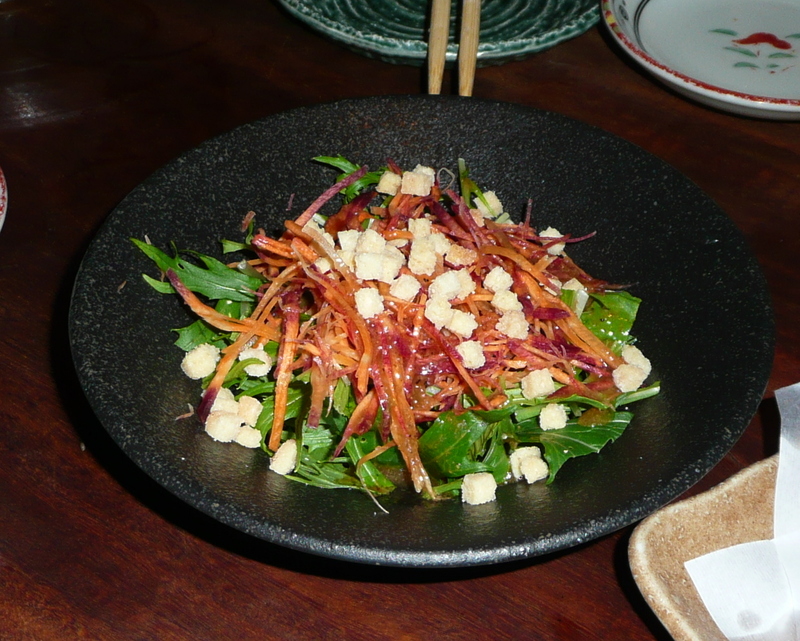 Mizuna (Japanese mustard greens) salad with vinaigrette. 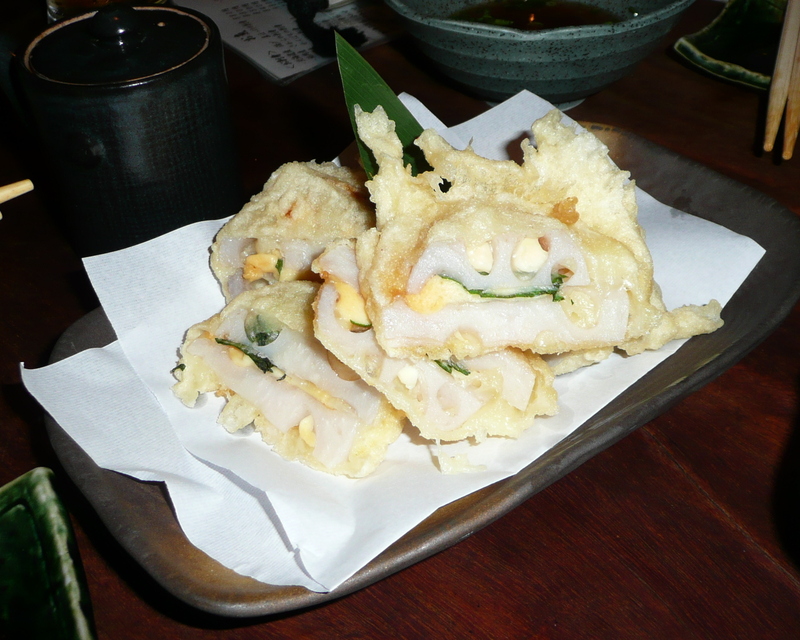 Lotus root steamed shinjo (dumplings) – this is unusual as they are usually fried rather than steamed. 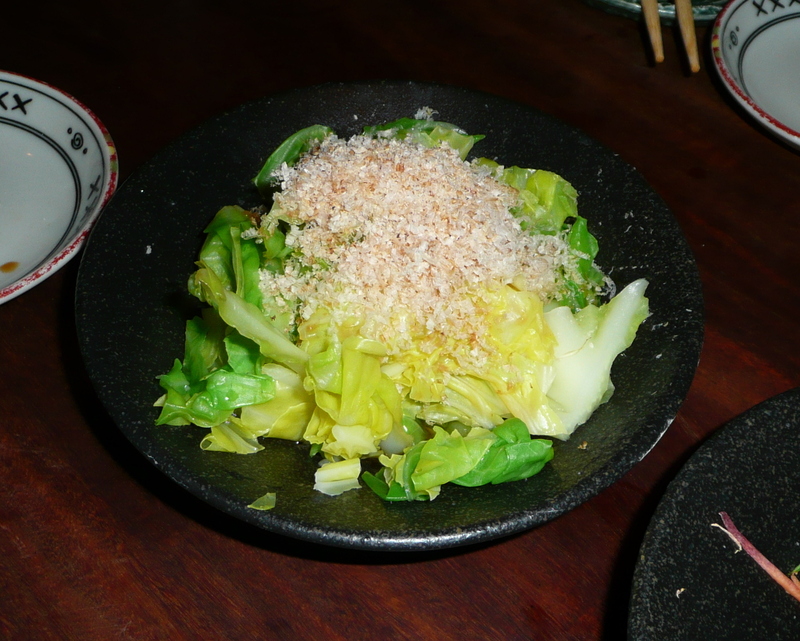 Cabbage with ponzu sauce and bonito flakes. It was an amazing meal and really a nice start to our trip. It was nice to visit with Taro and we’ll look forward to seeing him again Saturday. Friday we spent a lot of time exploring our neighborhood. Starting out with the local area, which is relatively low density, allowed us to get our bearings and explore a lot of wonderful little back alleys and side streets. I’ll write more about it in the coming days, but one of the highlights was a chance to see the sakura up close. Sadly, the ones in Tokyo are past their peak, but they’re still beautiful. 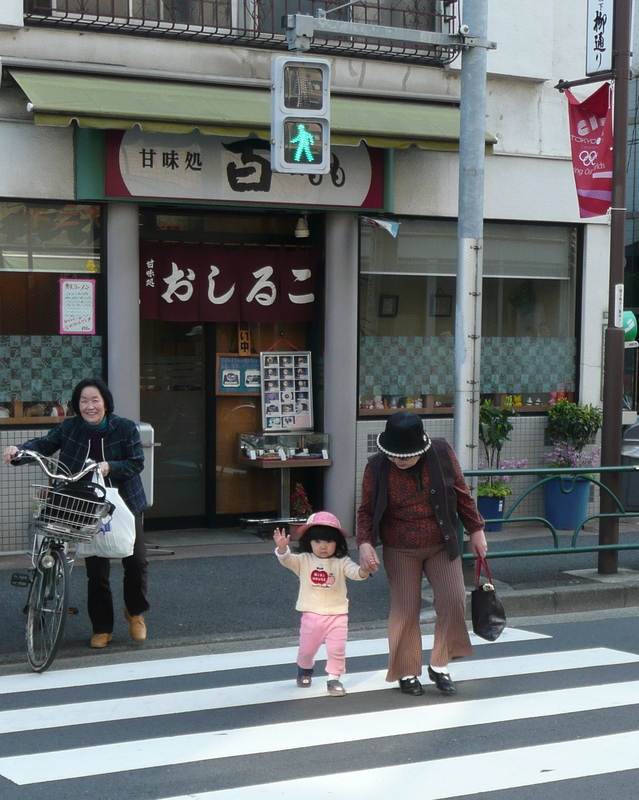 Finally, one of the cutest shots of the day: a little girl waves to us as she crosses the street with her grandmother. This entry was posted in Uncategorized and tagged cuisine, food, Japan, Tokyo, Ueno by christao408. Bookmark the permalink. Beautiful pictures… and the food looks amazing. Btw… that is a lot of food for three. I’ve never had burdock root before. I see it often in the markets here. The food looks great and the little girl is cute. I think your area is also close to a few museums (modern art). Have a safe trip! The food is amazing and the little girl looks like a doll. I love Jicama and use it a lot in my cooking. What’s the stuff on top of it Chris? Looks like ginger or honey sauce. Have a great trip. Damn you…your pictures make me hungry….again! I just recently had the tapas experience – so many things to sample… The Japanese version looks wonderful. Now that my salivary glands are in overdrive I have to go get some lunch. I miss Japan! I’ll be visiting there again in December. And that little girl is too cute – she looks like a doll! Holy crap that is one huge siu mai!! ^_^; The little girl is so cute. I can’t wait for my own trip to Tokyo later this year! …aawawhahwhahhrrrfff <– sound of longing? 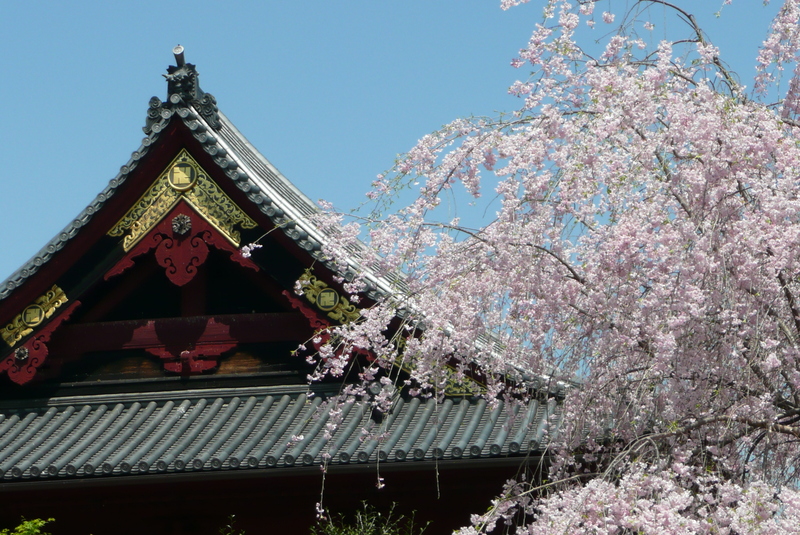 just finshed browsing my other firends pic in Japan during this Sakura Season( they wre there about about 10 days ago), now.. it’s your turn….it’s such a beautiful time to visit Japan….. and yes its a bit short….to enjoy the Sakura…. @ZSA_MD – I believe it is a light syrup made from unrefined sugar, somewhat similar to molassas in flavor. Oooh. Narita airport. I wish I could re-visit. Hope you’re enjoying your stay! And that little girl is definitely adorable! I want a miniature doll version of her to place on my desk. :o) Have fun!!! That is quite a Japanese food culture experience. I love Shui Mai, but wow, that is a super giant ball.